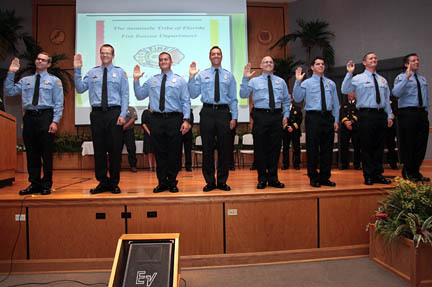 HOLLYWOOD — The Seminole Tribe Fire Rescue Department is so selective about who it hires that even to apply, candidates must have completed fire academy and passed the state certification exam. Out of 160 applicants this year, only eight were selected to tackle the department’s rigorous eight-week training program. Only after successfully completing training would they join the ranks of the 139-member department. All eight made the cut, and they were honored at a graduation ceremony March 27 in Hollywood. The new firefighters-paramedics from Class 14-01 are Sergio Alcazar, Dennis Byrne, Eduardo Costa, Kristoffer Durthaler, Joseph Sessa, Jeremy Smith, Darren Thompson and Gannon Yehle. After receiving their certificate from Fire Rescue Chief Donald DiPetrillo and taking the oath, they enjoyed a photo session and refreshments with their families. The training, held on each reservation, included cultural awareness, rural firefighting, hazardous materials, emergency medical response, helicopter transport, heavy extraction and awareness of culturally sensitive issues. Expertise in a variety of responses is necessary to serve the Tribe on all the reservations. On the rural reservations, 80 percent of transports to hospitals are for Tribal members. In Hollywood, 80 percent of trips made to hospitals are for non-Tribal people at the Hard Rock Hotel & Casino. Eduardo Costa always knew he wanted to be a firefighter. But after he finished fire and medic school, he learned how hard it is to get a job in fire service. He volunteered at Broward Sheriff Office’s Department of Fire Rescue for about a year to gain experience. When Costa went through school, he got a taste of the brotherhood and camaraderie among firefighters. Founded in 2004, Fire Rescue responds to more than 7,500 emergency calls and more than 40,000 non-emergency calls annually. The department staffs three fire stations in Hollywood, Big Cypress and Brighton, and two wild land divisions on Big Cypress and Brighton. About 22 million people visit the casinos, attractions and hotels on the reservations every year. Fire Rescue has arrangements with nearby municipal fire departments to provide aid as needed.